Actress Lori Loughlin leaves the John J. Moakley Federal Court House on April 3rd, 2019, after facing charges in a nationwide college admissions cheating scheme in Boston, Massachusetts. When faced with the prospect of serving hard jail time as a result of paying hundreds of thousands of dollars to get your kids into the party school of their choice, as well as the demise of a successful career playing an antiques dealer who solves mysteries, most people would probably keep their heads down and try to avoid attracting attention as much as possible. Most people, however, aren’t Aunt Becky. Loughlin is accused of paying $500,000 to college admissions scam mastermind Rick Singer to get her daughters into the University of Southern California by falsely claiming that they were crew athletes, despite the fact that neither of them had ever rowed crew. She faces charges of conspiracy to commit mail fraud and honest services fraud and a maximum of five years in prison. She is one of 50 people charged in connection with the scandal. 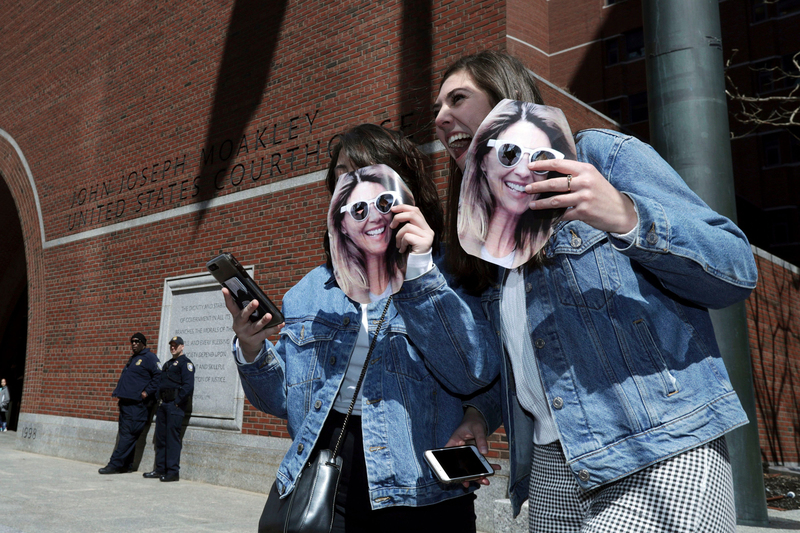 On social media, the response to Loughlin’s behavior was fairly split: While some viewed her sunny demeanor as inappropriate given the circumstances, others praised her “iconic” courthouse look (or “lewk” as some fashionistas might prefer) and unflappably cheery persona. The positive comments echoed those in support of Anna Delvey, the so-called “Soho Grifter” who also made headlines when she appeared in court last week wearing a low-cut Miu Miu dress and Celine glasses. So enjoy the limelight while you can, Aunt Becky. Because there’s a strong possibility that the next autograph you sign could be on the bottom of a women’s state penitentiary entry form.